Charles John Huskinson was born 29 August 1865 at Epperstone, Notts. At the time of the 1871 census, he lived with his family at Epperstone. He then went to study at Oakham Grammar School, where he was a boarder at the time of the 1881 census. The school was founded in 1584 by Archdeacon Robert Johnson, along with Uppingham School, a few miles away. On the 24th July 1894, he married Ann Symons Cox, at Cookham, Berkshire. Ann was born in the town in 1871. A few years later their son Patrick was born in 1897 at Farndon, Near Newark, Nottinghamshire. "V" OTICE is hereby given, that the Partnership hithertoL \ subsisting between us the undersigned, Francis Roper Larken, Walter Turner Toynbee, and Charles John Huskinson, carrying on business as Solicitors, at Lombard-street, Newark-on-Trent, and Pepper-street, Nottingham, under the firm or style of Lirken Toynbee and Huskin'son, has been dissolved by mutual consent as from the 1st day of January, 1899. All debts due to and owing by the said firm will be received and paid by the said Francis Roper Larken and Charles John Huskinson. —Dated this 5th day of January, 1900. FRANCIS R. LARKEN. WALTER T. TOYNBEE. CHARLES J. HUSKINSON"
At the time of the 1901 census, Charles worked as a solicitor, supporting his wife Ann, and son Patrick at the family home in Farndon. To help in the home , he employed three servants. 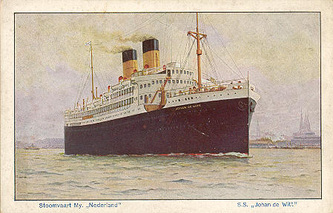 In 1907 there is a record of Charles travelling to the USA, arriving in New York, USA on 24 March, on the ship SS Philidelphia (sailing Southampton to NY). Passage paid by himself. In 1913 a new Drill Hall was proposed for F company the 2/8th Battalion Sherwood Foresters based in Arnold. The detachment was commanded by 2nd Lieuts. G. Clarke and A. F. O. Dobson The new drill hall was not only to be the local headquarters but also a training area and a recreation centre for Arnold. The new Drill Hall Arnold opened after much discussion and speculation on the May the 2nd 1914. The opening ceremony was attended by a great crowd of spectators who listened to Lt Colonel Henry Mellish perform the opening presided over by Colonel C J Huskinson the battalion commander. C J Huskinson also commanded the local Territorial Army Regiment. Col Charles J Huskinson served in the Sherwood Foresters in WW1. Details can be found in a "HISTORY OF 1/8th BATTALION, SHERWOOD FORESTERS 1914—1919"
"Lieut.-Col. Charles John Huskinson, T.D.,l/8th Notts, and Derby. Regt. (T.F.)" Charles took retirement and spent many of his later years travelling with his wife Ann. On 19 July 1919, Charles arrived in New York on the ship Aquitania, which sailed from Southampton, England. A few years later on 10 Apr 1926 Charles and his wife Ann arrived in London on the ship Cathay, having boarded the ship in Algiers. On 16 Apr 1928 Charles John Huskinson and his wife Ann arrived in London on the ship Guildford Castle, which originally sailed from Mombassa, Kenya. Then on 18 Apr 1930 he arrived in Southampton, having boarded the ship Johan de Witt with his wife in Algiers, his home address is listed as Sigsworth Wath, Near Pately Bridge, Yorkshire. He also took keen interest in the Newark Golf Club. The nine hole course at Hawton covered just under 40 acres held under a lease which in 1920 had only seven years to run. However, the landlord offered to sell the land to the club and at a special meeting of the members held at the Town Hall in June 1920 the committee were authorised to buy it for £1800. At the same meet­ing, a resolution was passed that the committee should set up a limited liability company with an authorised capital not exceeding £3000, divided into ordinary shares of £1 to be taken up by members. The purchase of the course was financed partly by a bank overdraft because although the authorised capital of the company was £3000, the club had only 220 members and most of them took just a £1 share each. The biggest shareholdings were: Enos Smith, The White House, Newark 100 W B B Quibell, The Croft, Balderton 50 Ernest Lees, 15 Lombard Street, Newark 50 H D Cherry Downes, Southfield House, Newark 25 C F Richardson, The Brewery, Newark 25 W A Warwick, Balderton Hall 25 Stuart MacRae, Handley House, Newark 25 . Other shareholders included members of well known Newark families: R P Blatherwick, C F Cafferata, W H Cherrington, W H Colton, C J Huskinson, H D Mumby, Mrs G Ransome, the Misses Maries, Miss Starkey and W P Woolfit. 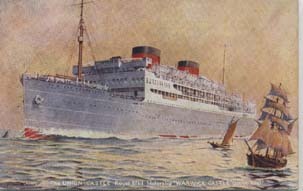 Charles John Huskinson died at Sea on the 5th June 1932, aboard the ship Warwick Castle . He boarded the ship in Cape Town, South Africa. The ship arrived in London on the 6 Jun 1932. Colonel C J Huskinson also received an OBE. Probate - Charles John Huskinson of Newark on Trent, Notts and of Sigsworth Wath (Near Pately Bridge) Yorks, died 5 June 1932 at sea. Probate Nott'm to wife Anne Simmons Huskinson, widow effects of £35,332. 10s 7D. Patrick Huskinson son of Charles and Ann, also went on to have a military career. Arthur Frederick Huskinson was born 23rd August 1867 at Epperstone, Notts. At the time of the 1871 Census, aged 4 he was living with his parents at Epperstone. By 1881 he was a cadet the ship "Worcester", based near Dartford. In the middle of the last century the need for pre-sea training was recognised for potential officers in the Royal and Merchant Navy. This led a group of London shipowners to found the 'Thames Nautical Training College' in 1862. 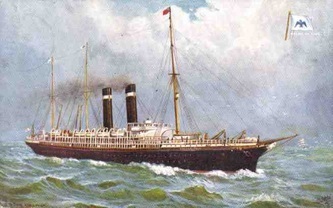 The Admiralty was approached for a ship and allocated the 'two-decker' HMS Worcester. At the time the Royal Navy was starting to replace their fleet of 'wooden walls' with iron clad vessels and they had a surplus of such vessels, including the 1473 ton 50 gun 'Worcester'. She had various berths before finally moving in 1871 to what became a base forever associated with the 'Worcester' - the village of Greenhithe where successive ships remained until the 1970s. 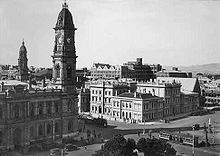 I have not been able to trace Arthur on the 1891 or 1901 census, but in 1902 he marries on the 25th October to Millicent Ann Newman in Adelaide, Australia. She is the daughter of Henry Walter Newman and Joanna, and was born 02 Jun 1867 in London, England. In 1904 they have a son, Henry Creft Huskinson, and in 1906 a daughter Alice Emily Huskinson. Harold Huskinson was born on 19 MAY 1870 at Epperstone, Nottingham, England . He was the 5th child of William and Emily. Harold was 10 months old at the time of the 1871 census, and was living with his family at Epperstone Manor, who were supported by 4 servants. He was still listed at the Manor House in the 1881 Census, along with his 6 brothers. I believe Harold went to study at Oakham School between 1882 and 1887, following in the footsteps of his older brothers. After his schooling at Oakham, he moved to London and studied medicine at St Barts. At the time of the 1891 Census he is living as a lodger at 58 Dogherty Place, London. 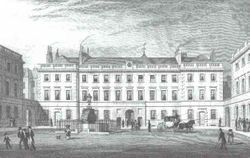 St Bartholomew's Hospital Medical College was established in 1848 to train medics although considered to have been started by John Abernethy when the hospital built a theatre for his lectures at the beginning of the century. 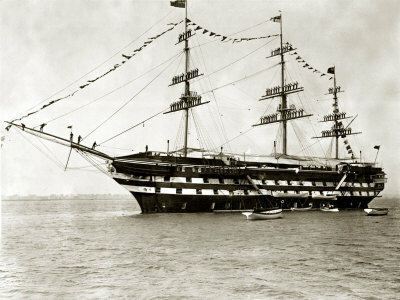 The Cambridge was laid down at Pembroke Dockyard as HMS Victoria in 1844. On 28 February 1857 she was ordered to be converted from sail to steam propulsion and to be fitted with 120 guns. She was renamed Windsor Castle on 6 January 1855 and launched on 26 August 1858. By 1862 she had been reduced to 97 guns. She was renamed HMS Cambridge in 1869. His time on the Cambridge was short, and he moved to be the Surgeon, on the Glory, on November 1st 1900. The Ship was built in 1899 and was designed for service in the Far East, where the new rising power Japan was beginning to build a powerful and dangerous navy. HMS Glory commissioned on 1 November 1900 for service on the China Station, departing the United Kingdom for China on 24 November 1900. 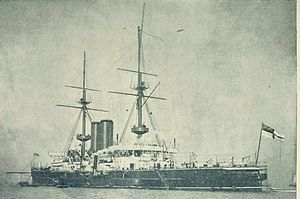 While there, she was in collision with battleshipHMS Centurion during a storm at Hong Kong on 17 April 1901, when Centurion drifted across her bows, but Glory suffered no damage. Glory refitted at Hong Kong in 1901-1902. I have no trace of Harold in the 1901 Census, but I suspect he may have been in the Far East, after being on the maiden voyage of HMS Glory. By 1904, Harold had returned to London, where he married Helen Agnes Wilhelmina Amory-Jones on the 1st of June. Helen was born in 1872 at Hyde Park Mansions, London. At the time of their marriage Harold was resident at Jermyn St, Piccadilly. This is where Fortnum and Mason is situated since 1707. HAROLD HUSKINSON, Fleet Surgeon, R.N. H.M.S. Blenheim, Home Fleet, Aug. 25th. Harold is listed in the 1912 to 1916 phone books at 29 Emperor’s Gate, London. This was a development by Matthew Scott's who built twelve houses (Nos. 26–36 consec., including a No. 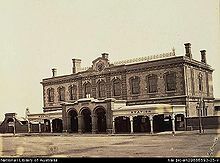 33A), in 1876–8. Though conventional in plan and restricted in width, they mark an attempt to invigorate the worn-out vocabulary of town-house design by surface enrichment of the elevations in a 'Gothic' spirit. The Emperor's Gate enclave drew the middle-class inhabitants commonly attracted to this part of Kensington. In the 1922 phone book he is listed as Dr Harold Huskinson at 6 Westminster Palace Gardens, Victoria, London. Between 1927 and 1933 he is resident at 7 Victoria Square, London. Victoria Square is a small residential square, located just to the south-west of Buckingham Palace. The square comprises about 25 residential houses, which are all Grade 2* listed as being of special historic interest. These are five-storey stucco-fronted properties designed by the architect William Wyatt constructed in the late 1830s to celebrate the beginning of Queen Victoria's reign. A former resident is Ian Fleming, who lived at number 16 Victoria Square from 1953 until his death in 1964. In 1933 Harold and Helen move out of London to Mosscroft, Binfield, near Bracknell. In the phone directories Harold is listed as a Surgeon and Captain in the Royal Navy. In directories in the late 1930s, the address is listed as Croft Cottage, Binfield, where Harold is listed until 1952. Helen died in 1952 in the district of Windsor, England. I have been unable to locate information regarding Harold’s death.